I figured we should kick of the Swim Into Summer event with a bang and Hayneedle has helped make that possible. Summer has arrived here in Florida and with temperatures already climbing into the 100's, it is important to have a way to cool down from the heat of the sun. Hayneedle sells the Intex Easy Set 15 ft. Round Inflatable Pool through their PoolToySource.com site. It is 42 in. deep and the perfect size for our family to enjoy. With easy setup and simple maintenance instructions, this pool is a great value and would be a great escape from the heat for any family this summer. "From hammocks to dart boards, dog houses to globes, our ever-expanding variety of online stores offers products for every part of your home - living room, bedroom, bath, kitchen, office, patio, garden, garage, and more. They're grouped in categories that make sense - patio & garden, furniture, home accessories, baby & kids, pets & animals, sports & games, seasonal & gifts. In fact, it all makes sense at Hayneedle - from easy navigation to one-cart checkout. Each Hayneedle store focuses on one specific product type, allowing us to offer true variety. According to consumer research, discerning customers seek an array of products to complete a theme or specific area in their home. Our universal cart allows customers to shop our 220 specialty stores using one shopping cart. Combine this with our proprietary concierge bar, which presents related stores and products, and creating ideal living spaces has never been easier." I have to admit, I was a little worried about this pool. It didn't seem like it could really live up to the claim that you can set it up in only 30 minutes. I also had doubts about it being sturdy enough to withstand four boys jumping and bouncing around in it for hours at a time. I was willing to give it a go. Anything that will cool us down in this heat is worth a shot in my book. So, after making sure everything was there, I decided to put Matt to work on the setup of the pool. That's what we keep men around for right? He laid out the ground cover, spread the pool out and started to smooth the wrinkles out. After that, he inflated the upper ring and put a few inches of water in the pool and smoothed out the rest of the wrinkles and pumps. Matt started working on putting together the pump and filter and put together that ladder while the rest of the pool was filling up. Overall, I was really impressed with how simple the pool and accessories were to put up. It really did only take about 30 minutes to setup and then only a few hours to fill up with water. By the next day the kids could get in, but it was still too chilly for me. A few days later, the temperature was perfect and we have been enjoying it everyday since! A few things to note before purchasing this pool. You can't hang on the side of the pool. Kids can use the side to stabilize themselves, but jumping or laying on the side will cause water to come out. The built in skimmer is great and really helps cut down on the debris floating around and the cover is super easy to put on, even by yourself. If you have cats, you will need to devise a way to keep them from jumping up on the ring, as they can deflate it. We had to do a few days of hose duty to spray the cats away, but they eventually got the idea to stay down. This is a great temporary pool if you are saving up for something more permanent and if taken care of properly, it could potentially last you for many years to come. 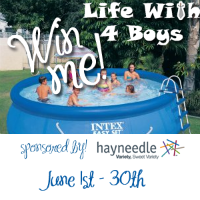 You can buy the Intex Easy Set 15 ft. pool on the Hayneedle site, as well as a wide range of other swimming pool toys and even smaller inflatable pools as well. * I received an Intex Easy Set 15 ft. Pool for the purpose of review, but was not compensated in any other way for this post. All thoughts expressed here are my own. Each year as the boys get older and more confident swimmers I am making more and more memories. It's so fun! I liked the Hayneedle pool page-My favorite memory will always be spending the day at the beach with my 7 kids and my sister's 3 and no one complaining they are bored! y favorite memories are being on wim team and having fun w/ my teammates. I liked them. My favorite summertime pool memory would be just laying in the pool on a float and reading a book. So relaxing! Liked.. 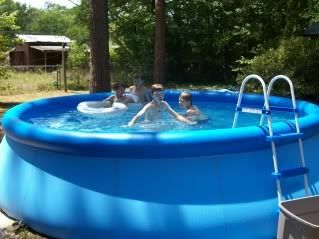 I always loved having an inground pool when we lived in VA. It isn't really fesible to have one here in WI but would love an above ground for the kids to play in. and my fav memory is swimming in the summer at the public pool and learning to dive off the diving boards, soooo fun!!! My favorite swimming memory is all the years I spent at the pool with the kids during their swimming lessons. and i LOVED going to the swim club w/ my family and swimming for hours on end. I "liked" the pool page! My best memory of swimming is when I would go and stay with my cousin, they had an inground pool and we would swim in it all the time! We had so much fun! Iliked Hayneedle and my favorite memory of summer swimming would be down at the local park (Wyandotte Park in Louisville KY) where I took swimming lessons and went swimming often. I follow Hayneedle on twitter. I liked and my favorite summer time swimming memory would be when I was a kid and we would go camping. All my aunts and uncles and my grandparents would camp with us. My grandfather and my great uncle would go out in the boat to go fishing early in the morning. All of us kids would go down to the boat launch area and swim in the Mississippi River. We would stick a boat oar in the water where it dropped off and all the kids that couldn't swim couldn't go past that oar! We'd swim all day, and then eventually my grandpa and my great uncle would come in with the boat, arguing as they pulled in about the number of fish they had caught and who had the best one!! All us kids would get out of the water and help bring in the boat!! I'll never forget those days!! I follow Hayneedle on Twitter! My favorite memory was going on vacation to Utah each Summer. I was able to spend the whole week in the outdoor pool and LOVED every minute of it. I like the FB page. My fave memory would have to be going to the community pool with a bunch of cousins and enjoying the summer together. I liked the pool (Nadine E Larsen) My favorite memories are going to my Grandmother's house to swim in her built in pool. My whole family being there, playing and laughing. Great days. My mom let me have a pool party to celebrate 6th grade graduation. It was a blast!! Liked Hayneedle on FB. My favorite memories were swimming in Lake Berryessa - We went camping there all the time and my brother in law would throw us in the air and we would land in the lake - we would swim so much we would feel sick! My favorite swimming memory is my honeymoon to Jamaica where we did a night dive - it was AWESOME! I clicked the like button on the pool page. My favorite summer memory was spending an entire weekend at Wild Water Adventures. I visited the Hayneedle Site and clicked the like button on the pool product page and My favorite summer memory is our first vacation to the ocean my girls where is such amazement over the vastness of the water they were so cute and said that was the biggest swimming pool they ever seen! watching my grandson Eli learn to swim!!! Like Life With 4 Boys on Facebook, widget is at the bottom of the blog. Like Hayneedle on Facebook, you can let them know I sent you. my favorite memory is my 13th birthday party- we had a huge pool and we all played marco polo in the pool! So fun! I liked the pool. My favorite swimming memories were the times we spent as a family at a low water bridge in the country near my Uncle's house. We had so much fun. The water was so clear and cold. Sometimes miss being little.